The Blanka Rosenstiel Lecture Series on Poland - Polish Play: "Tamara L."
Thursday, Nov. 9th, 2017 | 7:00 p.m. 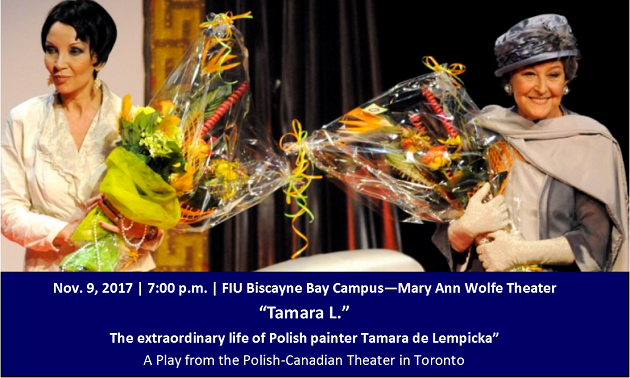 The European Student Association at FIU, in collaboration with The American Institute of Polish Culture, The Honorary Consulate of the Republic of Poland, and the European & Eurasian Studies Program at FIU, is pleased to invite you to a play about the life of Tamara Lempicka, an extraordinary Polish painter-artist. Tamara de Lempicka (1898 - 1980) was an artist whose stunning work defined the glamour and sophistication of the Art Deco style. She was born Maria Gorska into an affluent family in Poland. She married Tadeusz Lempicki and lived in St. Petersburg, Russia, but during the Russian Revolution, they fled to Paris. She immersed herself into the life of an artist there, changed her name to Tamara de Lempicka, studied with successful cubist and avant garde painters, and began to develop a visual style that was new, sensual and elegant. Her art was the epitome of French Art Deco and it brought her fame, fortune, awards and exhibitions all over the world. She also lived in the Switzerland and the US. Lempicka was on top of the art world for many years, but Art Deco eventually lost its allure and her star waned. However, in the 1980's the Art Deco style was popular again in America, and Tamara de Lempicka's work returned to the center of the art world. 7 p.m. - 8:30 p.m. Play “Tamara Lempicka"